FIMS Film Fest (THIS THURSDAY) Accepting Submissions! Accepting submissions until February 28, 2012, at 10:00 AM. FIMS is a faculty of critical alternative thinking. We promote creativity, originality, and innovative ideas, and we encourage you to submit any style or genre of film that you have created. If there are any questions or doubts as to what makes a film appropriate for the FIMS Film Festival, please contact us. Feel free to email questions to FIMSFF2012@gmail.com. All submissions may be delivered to the FIMS Dean’s Office and must be accompanied by a completed submission form. The FIMS Dean’s Office is open on weekdays from 8:30 a.m. – 4:30 p.m.
FIMS Film Festival (FFF) is open to all post-secondary school students currently enrolled at the University of Western Ontario and all of its affiliate colleges including Brescia University College, King’s University College, and Huron College. Films must be directed, edited and produced by eligible post-secondary education students. Professors or advisors are permitted to oversee the project and provide general direction. Films must not involve professional filmmakers. Submissions must be received by February 28, 2012, at 10:00 AM. All films must have been produced after January 1, 2008. Films must not exceed 10 minutes in length including credits. Participants can only submit one (1) film. The mitZine and MITSC have the right to reject films with excessive violence, swearing, innuendos and/or violence. Due to the volume of submissions, there is no guarantee that your film will be featured online or screened the day of the festival. Participants are responsible for obtaining any necessary approvals for use of music, visuals, and screenplays. The FIMS Film Fest accepts no responsibility for copyright infringement or other misuse. By submitting a film, participants expressly grant permission to the FIMS Film Fest to use clips of their film(s) for promotional or other purposes designed to further the FFF. NOTE: The Rules and Guidelines are subject to change without notice at any given time. DISCLAIMER: The FIMS Film Fest assumes no liability for the content of submitted films. Any views, expressions and opinions are solely those of the filmmaker(s) and they do not represent those of the MITSC or the Faculty of Information and Media Studies (FIMS). I have read and accept all of the Rules and Guidelines of the FIMS Film Fest. I am legally authorized to enter this movie in the Festival. I authorize the Festival to duplicate my film and to use my film for promotional or publicity purposes. The Festival will not sell, lend or otherwise transfer your information to any other organization or persons not directly affiliated with the Festival. Films that use copyrighted music will not be penalized. The FIMS Film Fest and the MITSC are not responsible for any legal issue that may arise from using copyrighted music. 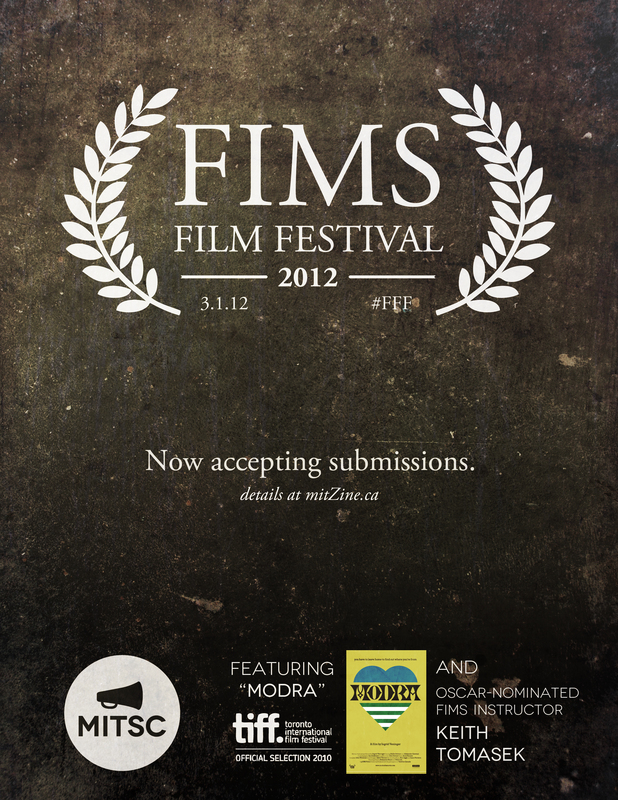 FIMS Film Fest (3.1.12) Accepting Submissions!